When we are talking about Filipino pasta it is always the Filipino Sweet Spaghetti that is mentioned or remembered but those days may be gone because there is someone new on the block that falls under that same category and its gaining a bit of popularity, the Tuyo Pasta. I never heard of this back then when I was in the Philippines but during the last couple of years I saw this gaining popularity online through blogs. Tuyo during the past was associated with poverty, with similar status to other dried salted fish due to the fact that a piece of this fish can be paired with lots of rice due to its salty nature. Having said that two to three pieces of this inexpensive fish can feed a person as long as it accompanies a ton of rice. Today it seems like it’s getting out of that status as I heard dishes where this dried fish is used are now penetrating upscale restaurants. When I first heard about of this pasta I was intrigued on how it tasted but after I remembered that I had tried a nearly similar Italian version where it uses anchovies I thought the flavour profile will be the nearly the same, it will be salty and fishy. Indeed it was but in a good way, most of the recipes online just use garlic, olive oil and flaked tuyo but I decided to add cheese like feta and Parmesan to give it a creamy flavour, I also added some sun dried tomatoes and lemon juice to give it some acidity then finally some cayenne to give it some zing. The result is this umami filled pasta that can contend with the Italian version that I was mentioning above. Cook spaghetti or vermicelli according to packet instructions, drain then reserve some of the cooking liquid. Pan fry tuyo for 1 minute on each side, let it cool then remove the scales and bones then flake the fish meat. Set it aside. In a pan add olive oil then sauté garlic, add the sundried tomatoes, cayenne pepper, tuyo and spaghetti. Mix well to distribute the flavours evenly, cook for a minute. Add 3 tablespoons of the liquid used for cooking the pasta, juice from ½ a lemon and parmesan, season with salt and freshly ground black pepper give it a good mix then turn heat off. 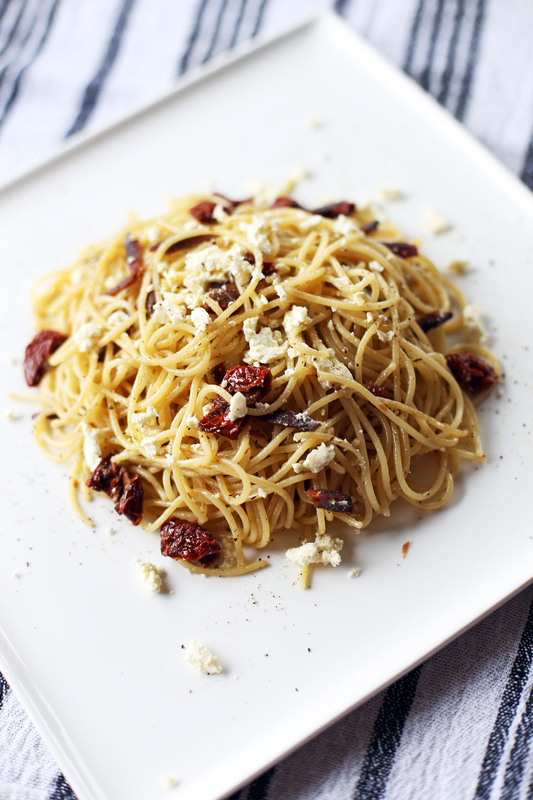 Place cooked pasta in a plate then top with crumbled feta cheese or Kesong Puti. This very well may be my dinner tonight! 🙂 Yarm! hmm, seems salty and tangylicious too me…. never had any tuyo before, tempting to hunt that now…. This looks like a dish I would really enjoy. I’ll have to see if we have dried herring anywhere. I don’t know that I’ve seen it before, but then again I don’t think I ever really looked! 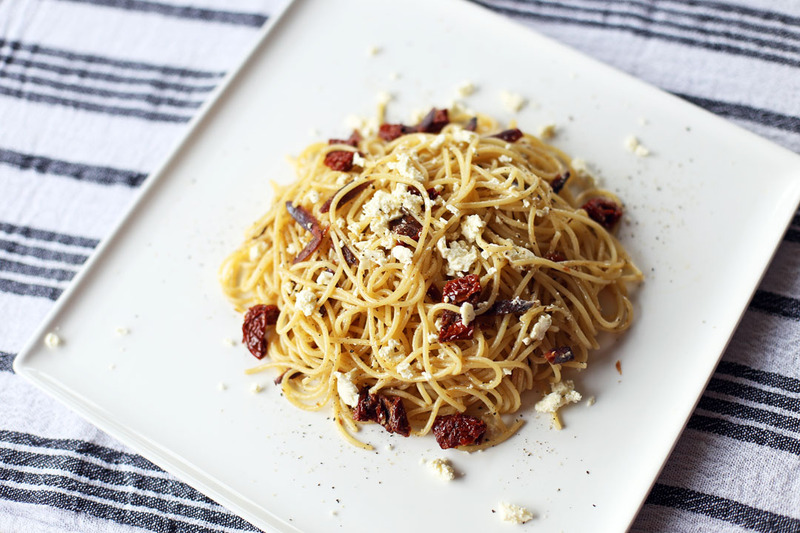 Interesting to use salted fish for pasta recipes, looks delicious!